Love is sweet poison. 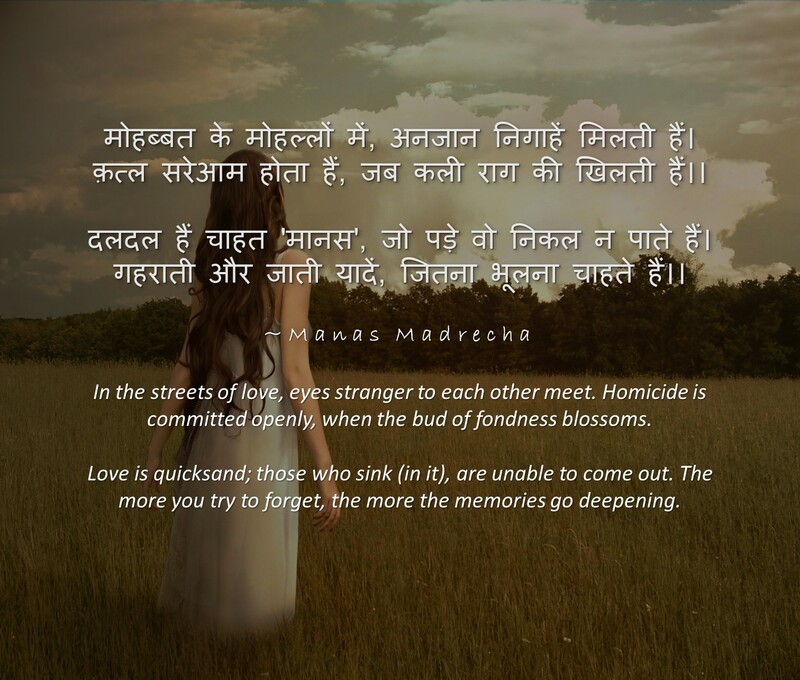 Here is a poem by Manas Madrecha, that narrates the aftereffects of relationships and precautions to be taken before ‘falling in love’, by reciting what happens when love gets disillusioned. In the streets of love, eyes stranger to each other meet. Homicide is committed openly, when the bud of fondness blossoms. The eyes unite, the hearts join, and then awakes the thirst of meeting. But it never quenches, even if the lover comes nigh. When the obsession of love spreads on, the togetherness seems like heaven. But, it is moonlight for a couple of days, and then comes the moonless night. When suspicion and jealousy pull apart the garland of love, on crumbling of the pearls of trust, the pieces of heart gets crumbled. The heart screams out, when it endures the punishment of attachment. Alone, it groans in pain that how will it be able to survive in separation! As much you can cover with the sheet of love, spread your legs that much only. If the conscience gets lost in passion, then what is the well being of the heart’s delicacy! Before committing the mistake of love, do know this thing. To know someone to be your “life”, is identical to take away your own “life”. Love is quicksand; those who sink (in it), are unable to come out. The more you try to forget, the more the memories go deepening. Manas Madrecha is an Indian poet, blogger and Chartered Accountant, with a keen interest in poetry, storytelling, and Jainism.